Just weeks after an arsonist burned down a home being built to house farm workers in Nipomo, a Santa Maria company is proposing building 30 houses to accommodate up to 600 farm workers. Unlike the Nipomo project, plans call for the farm workers to be housed in a rural area. The project, which is located on a ranch west of Santa Maria and Orcutt, faces some opposition due to its classification as a “labor camp.” Also, social justice activists question the proposed living conditions for the farm workers. Earlier this year, strawberry farmers Greg and Donna France began construction on seven homes located in a Nipomo residential neighborhood. The Frances planned to house a minimum of 112 migrant workers from Mexico and Central America, who would live 16 to a home for about nine months out of the year. The project prompted outrage in the primarily Hispanic neighborhood, and on the night of April 6, an arsonist set fire to one of the homes under construction. The Frances then abandoned the project. 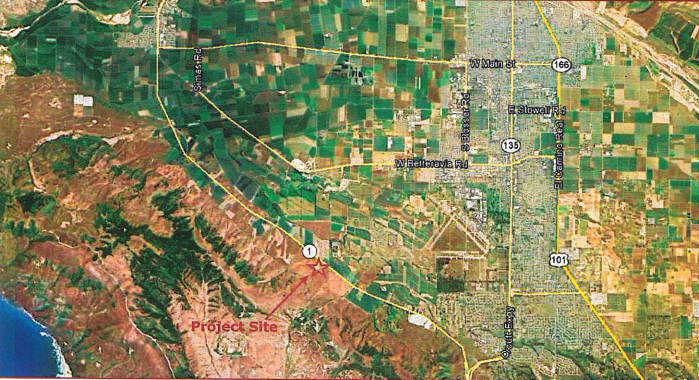 On June 1, the Santa Barbara County Planning Commission will consider approving a conditional use permit that would allow Betteravia Farms, a subsidiary of Santa Maria produce company Bonipack, to construct a farm labor camp under the federal H-2A program. Bonipack plans to build the farm worker housing on the Curletti Ranch located on Highway 1. The site is northwest of the intersection of Highway 1 and Black Road. The proposed houses are 1,443 square feet and each contain two toilets and two showers. Company officials also plan to construct three common area structures that will contain kitchen and laundry facilities. Buses would transport the workers to and from work, and vans would transport the workers to and from errands. Project plans call for each worker to be allowed a total of three vehicle trips per week to address personal needs and for recreation. The H-2A program does not allow migrant workers to have their own vehicles. Critics of the project have said the workers should be allowed more than three weekly trips off the ranch for non-work reasons. Oooo, maybe the company can also set up a store and pay them in company script! This is bad news for the entire Central Coast. The Big Ag farm owners have control of the Santa Maria ‘Sanctuary City’ politicians, and they are making a concerted effort to push all sorts of this baloney. They are knowingly using the treasure of government to socialize the cost of their farmworkers, and don’t believe for a second that these workers with H1 visas will not dip into taxpayer-funded services. Santa Maria Mayor Alice Patino and 5th District Supervisor Steve Lavignino are both ‘Sanctuary City’ politicians and help facilitate this scheme. Do not let what has happened in Santa Barbara County happen in SLO County. this is just one example of what’s out there as far as the kind of housing needed for seasonal workers. We could learn a lot from our neighbors to the north. why don’t they rent portables to provide temporary housing for the TEMPORARY workers. It’s done all over the world very successfully. why don’t they lease the empty buildings behind Cuesta College on O’Connor Way? Be cheaper even with busing them an extra 30 miles per day. Geez, 8 down votes, NIMBY huh? 16 per house wasn’t enough, so they doubled it? Nipomo or Santa Maria, town or outskirts, it’s still inhumane. You want the guest workers, fine. Got no problem with that. Now provide them a decent existence. Greedy schmucks. This country has been flooded with “guest workers” for decades us them, don’t allow anymore to invade the USA. This seems to be where low income housing is heading: 1400 square foot house for 20 guys equals 70 square feet per person — that’s 7×10! Ten guys per toilet, ten per shower. Why don’t they just admit what it is — a slum? They’re called “barracks.” Look up the term. If similar accommodations are good enough for our military servicemen and college students, why not guest workers? Then they should build barracks. I’m sure barracks had more than one toilet and one shower per ten people. But they’re building things that are houses. Barracks can’t be sold for California housing prices, which is why they are a bad investment and which is probably why the farm owners are trying once again to build houses. Based on the first reference file I’ve included a link to at the bottom of this post, these “houses” are barely meeting minimum square footage per person (minimum is 72 SF of “sleeping space”). The 72 SF minimum is only floor space, and does not include restrooms or showers, so if the 2 showers and 2 toilets make up a maximum total of 3 square feet, then they’re meeting minimum requirement of 72 square feet of floor space for each person, but if those showers and toilets exceed 3 square feet (let’s all be honest, they better exceed that!) then they do not meet minimum requirements of a barrack. This also does not include the space required for any stairs if the “houses” are 2 stories, and it also does not include any additional walls that may exist within the “houses” which occupy even more space, reducing square footage per person to probably well below the 72 square feet minimum to lower the risk of disease transmission. So I’m thinking that what they’re providing these farm workers is less than what our service men and women or college students get. Only mentioning this for the sake of clarifying the definition of “Barracks”. Based on the document I found titled, “Base Camp Facilities Standards”, dated “effective 15 Nov. 2001”, the number of toilets and showers to the amount of inhabitants is equivalent to the ratio used for base camps (1:10), so that seems to be sufficient. Although the true square footage per person is below the minimum required to be considered a barrack, I do agree with hijinks about calling these buildings/this facility what it truly is (i.e. barracks) instead of passing them off as “houses”. I do however agree with you too “unlisted” person, that the accommodations these farm workers will receive will be very similar to what our base camps and college dorms are, so any one who mentions that these “houses” are “inhumane” might also want to throw a fit about our base camps and college dormitories, unless they’d like to stay ignorant since they don’t normally house migrant farm workers. That’s really up to them though. So along with their pay they are provided with housing and still unemployed legal Americans will cost more per hour? Can you say slave labor? Unemployed legal Americans don’t want the work. And wtf are you going on about slavery? They want to work and do so. Education is really the issue here. So the farmers are paying such low wages that the workers can’t afford their own dwellings? sounds like indentured servitude to me. If the welfare chain were cut; unemployed legal Americans would most certainly take those jobs. You are misinformed. Under the visa program they are required to house the workers. The workers prefer it anyway as they have every intention of returning to Mexico and it allows them to save more money. They are actually paid pretty well, usually at least $15/hr. Fine…then give the American that hasn’t had a decent job in 8 years that $15 and a home to live in. Send the “workers” that want to go home (your words) back home and hire unemployed Americans. Hell to work outside on the beautiful central coast at above min wage and free housing too? Not bad, sure beats sitting in front of a McDonalds asking for handouts between welfare checks. Unfortunately, most of your unemployed Americans are too lazy and out of shape to work in the fields. Too many of them would rather sit on their asses and ask for handouts than actually work. Then stop the handouts…why do you just except the status quot? American citizens are being reduced to the equivalent of zoo animals waiting for their daily allotment of food. They are lazy because of our misplaced compassion. You may be okay with their plight in life but I’m not, these men and women are Americans and they should be trained and hired and directed towards a better life not just kicked to the curve while illegal aliens take their jobs. Don’t forget…illegal migrants don’t only work the fields they are working in fast food and construction and many other occupations. All one needs to be hired is a SSN# whether it’s real or not. No one is checking. They have absolutely NOOOO intention of returning to their country of origin, and plan to live forever on YOUR Taxpayer dime. Just ask Patino & Brown. Illegals & Anchor babies are costing us Billions every year…and you want more? If there is a problem with this proposal, the alternative should be no foreign nationals allowed and a four year degree prerequisite for all field workers. Right because your silly self wants $10 tomatoes.